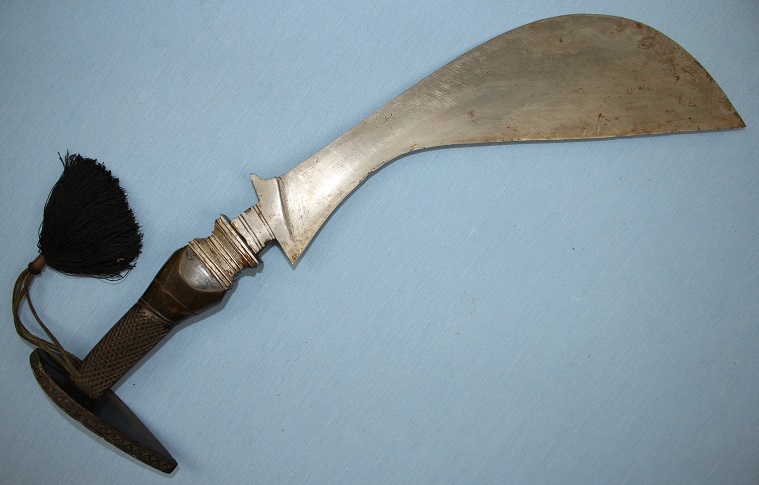 A rare Southern India war knife from the Coorg people of Kodava. This fine horn hilted example measures 49cms long when measured from the centre of the tang at the base through to the tip of the blade. 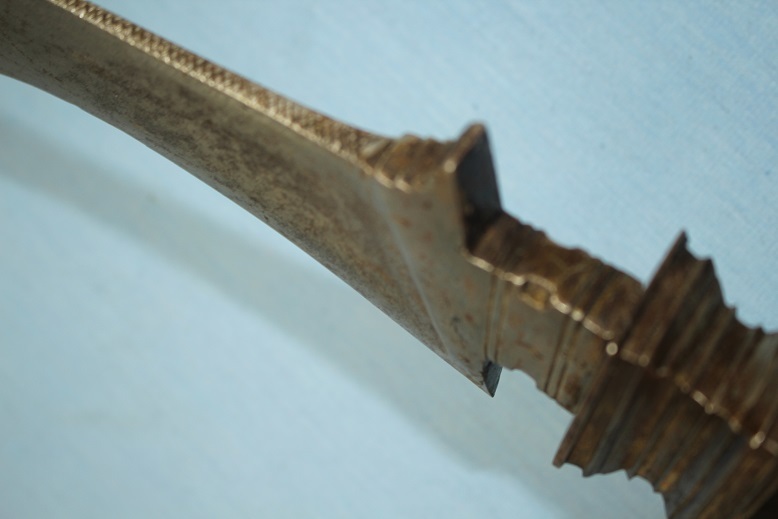 The blade, from the centre of the bolster to the tip is 35cms long and 9cms across the belly. 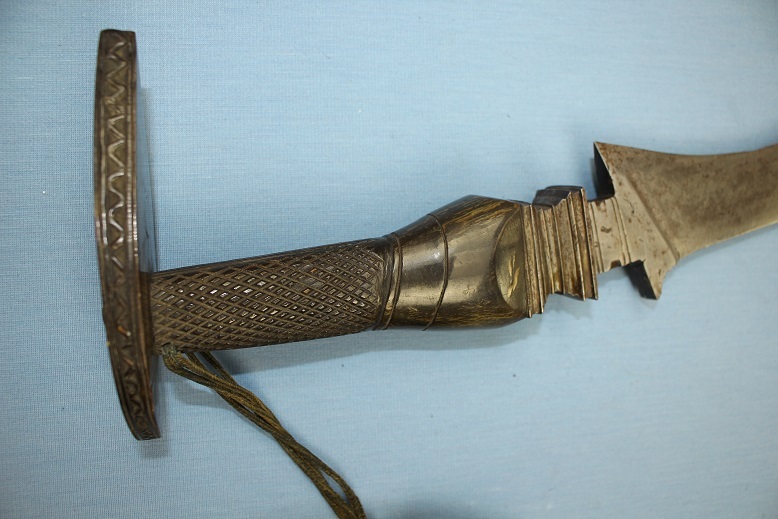 To the left face of the blade, there is an impressed icon, possibly an armourer's stamp, a marking that I have not yet seen on any Ayda Katti within collections or previously in the marketplace. Any markings typically found on these knife types are gold inlaid plugs stamped with the "Om" symbol. The base of the blade, where is enters the architectural inspired bolster is 12mm thick. It is from this point that the blade tapers acutely to the narrowed waist. The lower section of the spine is covered with incised lines which are utilised as a striker for flints. The blade is a very strong and well forged example with its cutting edge sharp for the entire length. The large faceted bolster measures 4cms x 2.5cms. 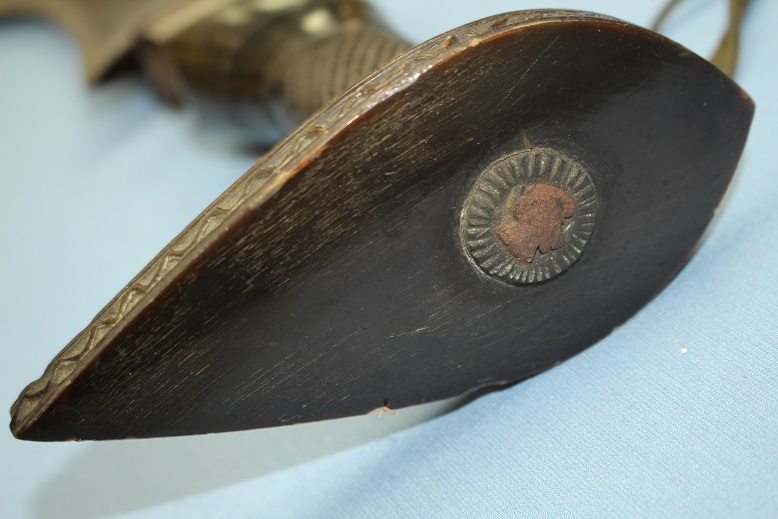 The black carved horn grip and pommel remain is excellent condition throughout and are without cracks or loss. 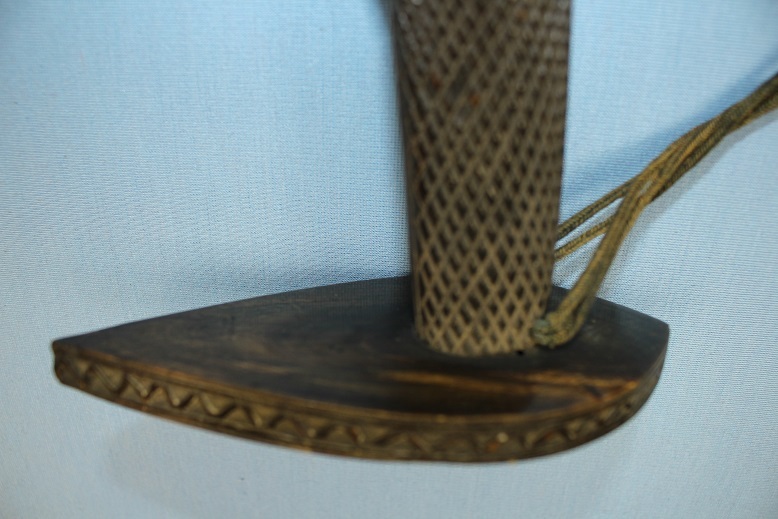 The base of the grip is pierced and retains its original decorative lanyard. The oversized pommel is 1cms thick, 5.5cms wide and 12cms long. 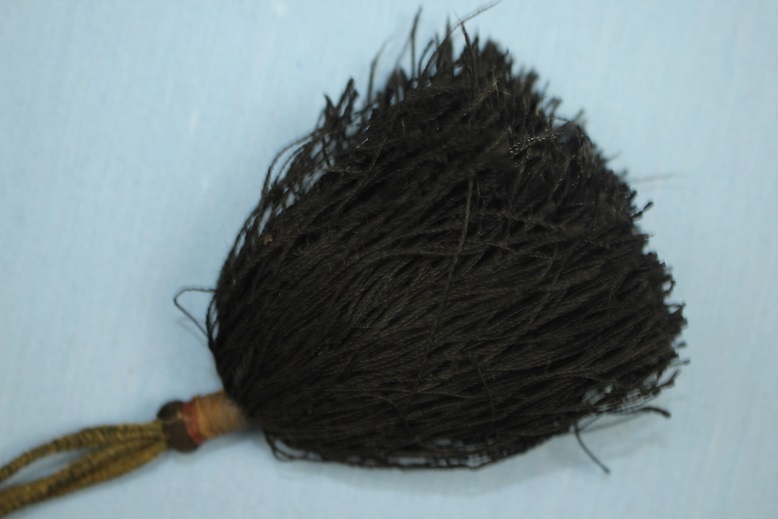 The tang is peened over a decorative bronze rosette. With consideration given to Robert Elgood's notes about the some 17,000 + Coorg weapons being dumped at sea in the mid 19th century, weapons from this region are seldom found. 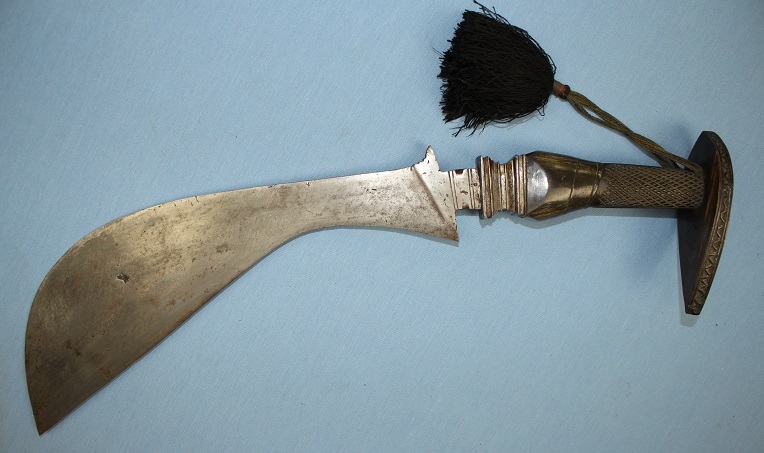 A very good example of a rare Coorg war knife that remains in excellent condition throughout.